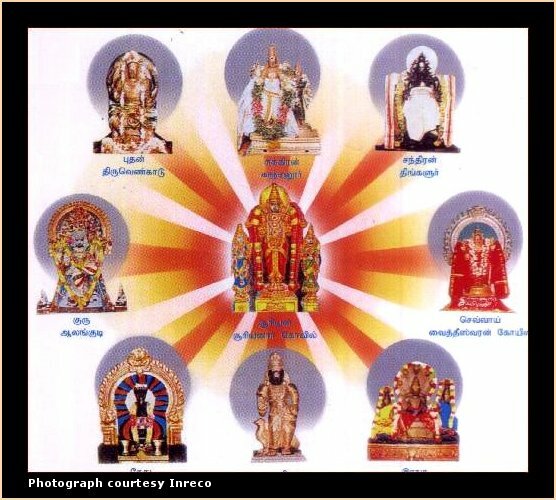 The Navagrahas (including Surya) have great importance in Hindu Rituals. They are considered to play a major role in deciding the destiny of man. and remove obstacles from our way. The names of the seven bodies (Sun, Moon, Mars, Mercury, Jupiter, Venus, Saturn) are still connected, in some languages, with the seven days of the week. In astrology, great importance is placed on the positions of the various planets in the twelve constellations of the zodiac, the belt around the sky in which the movements of Sun, Moon and planets are confined. All astrology is totally based on the planetary movements and its effect on human beings.